I have been to a few places on your bucket list, such as Cinque Terre, Sicily and Puglia. Yet to visit others. For now my bucket list of Italy consists of Turin and Le Marche. I have had some wonderful times in Le Marche as I went to school there twice and rented a house there for 4 weeks another time. You have been to so many places George. The only place I have not been to on your bucket list is Sicily. I am happy to see that Lucca is on your list. Soon you will have time to see them all. Come to Triest! I would be glad to show you this beautiful city in the North-East of Italy. You would be surprised how beautiful this region is. I wait for you! I have been to the area but my wife has not. We will be going in 2 years. See you then. If I ever have the means, I’d love to visit the Isle of Capri. Capri is very special. Most tourist go only for a day trip from Naples or Sorrento. If you go, go for at least one night. The island changes personality and becomes less crowded after the last ferry departs. Another place that fascinates me is the Costa Esmeralda. Have you been to Sardinia or the other islands in this group? Not yet but I want to. Maybe in 2018. We are planning a large party in Italy with family and friends. That’s wonderful. I look forward to your future posts. You take great photos and your postings are easy to follow. Thanks Cristina, i will read it. 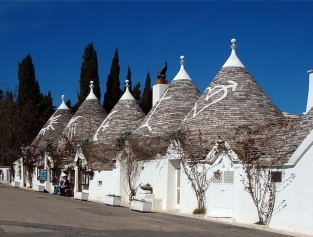 I am looking forward to Puglia! But the first destination I memorised is the amazing (but normally not accessible to general public) Castle of Sammezzano near Firenze with its 365 rooms.